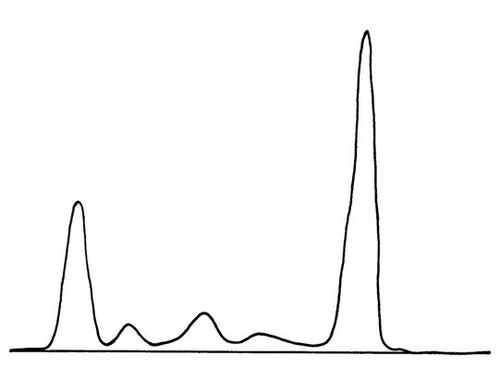 Bence Jones protein - free light chains; An abnormal plasma or urinary protein, consisting of monoclonal immunoglobulin light chains, excreted in some neoplastic diseases and characterized by its unusual solubility properties as it precipitates on heating at 56 to 60° C and redissolves at 90 to 100° C. It is measured by immunofixation electrophoresis (IFE). Complement - A functionally related system comprising at least 20 distinct serum proteins that help destroy foreign cells identified by the immune system. Understanding how to interpret concentrations of proteins in body fluids is important because proteins have crucial roles in many biological responses. In addition, changes in protein concentrations often provide the initial evidence allowing clinicians to diagnose a variety of disease states. For pharmacists, understanding the analysis and interpretation of plasma proteins is especially important as most plasma proteins are synthesized by the liver which is a frequent target of drug toxicity. Tissue damage and subsequent inflammation caused by trauma, tissue necrosis, immunomediated cell damage (as in auto-immune or immune complex disease), as well as viral and bacterial infections trigger the acute phase response which includes the increased synthesis of the acute phase proteins. In the case of bacterial infection the response is much larger than that by an equivalent amount of inflammation of other origin. The difference is due to the potent effect of bacterial endotoxin in inducing cytokine (TNF alpha, IL1, IL6) release from macrophages, which in turn stimulates the liver to synthesize acute phase proteins. Bacterial DNA, unmethylated CpG sequences, IL12, etc are important inducers of this reaction. In general, this reaction reflects innate immunity. 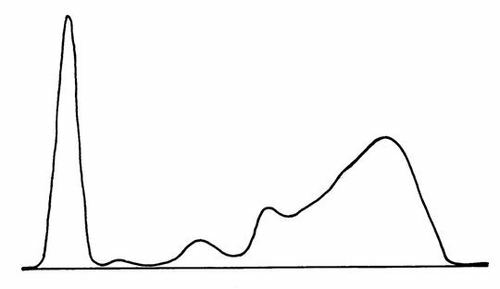 The time curve of elevation of individual acute phase proteins and the degree of elevation of individual proteins differs in various disease entities. The alteration in acute phase protein concentration in serum is due mainly to changes in the transcription rate of genes within hepatocytes. The specificity of increases in acute phase proteins is high for tissue injury but low for specific disease entities. One of the most useful aspects of acute phase protein measurements is the sensitivity to small amounts of inflammation. 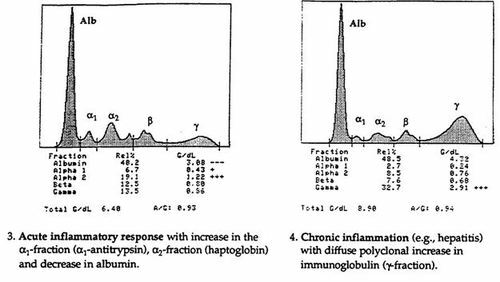 C-reactive protein (CRP) is the measurement of choice for the detection of acute inflammation and in monitoring the response to treatment of inflammatory disease. In chronic conditions, the erythrocyte sedimentation rate may be the preferred measurement. 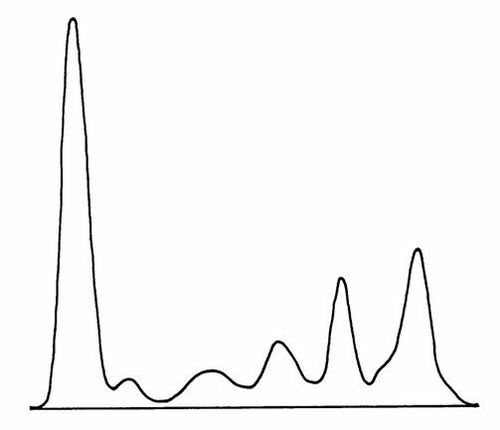 The increase in synthesis of acute phase proteins is accompanied by a decrease in prealbumin, albumin, and transferrin, the so-called negative acute phase reactants. Thus, there may be little change in the total protein concentration. 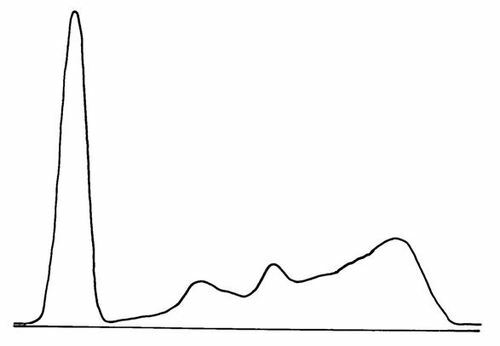 In the acute phase response the most striking pattern on electrophoresis is an increase in the α1 and α2 regions. 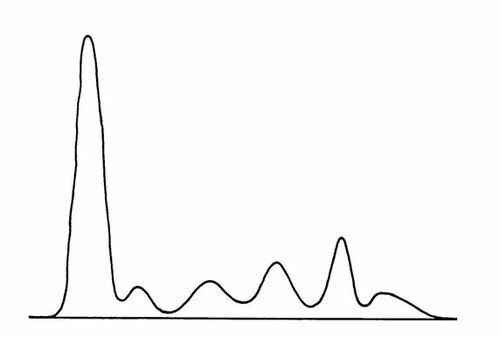 Albumin, prealbumin and transferrin are negative acute phase reactants (decrease in concentration) thus there may be little change in the total protein concentration. 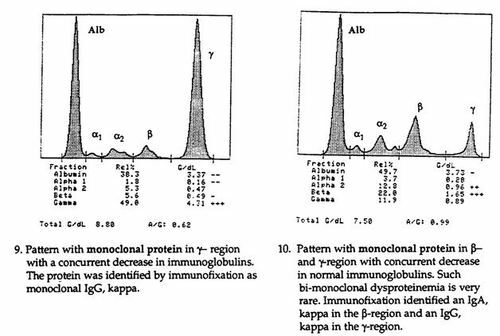 A single clone of immunoglobulin-producing cells usually synthesizes only a single immunoglobulin, or monoclonal protein, which separates electrophoretically as a homogeneous band giving a discrete peak. 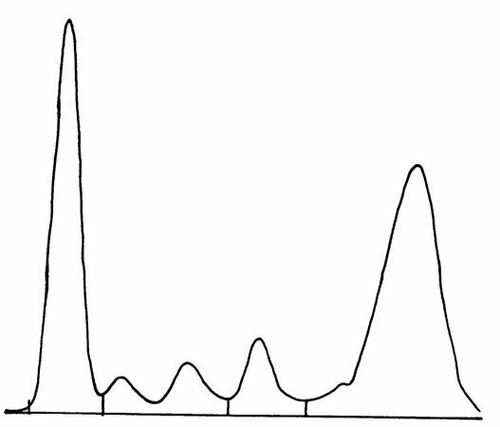 These M-proteins may be of the IgG, IgA, IgM, or (less commonly) IgD or IgE type and may appear as a sharp peak on electrophoresis anywhere within the beta and gamma regions of the electropherogram and rarely in the α-region (1-2%). Multiple myeloma is a disease of older adults characterized by bone pain that is caused by a malignancy of plasma cells. In multiple myeloma bone marrow cells become replaced by plasma cells which often produce unregulated amounts of a monoclonal antibody that can be detected in serum. On bone biopsy plasma cells >30%, 3 or more lytic lesions would define the patient as having multiple myeloma. As bone marrow is replaced, patients become anemic and eventually have bone marrow failure. The bone marrow lesions can be visualize on x-ray as characteristic “punched out lesions” which leads to bone pain, osteoporosis, pathologic fractures, and hypercalcemia. Immunofixation studies indicate that the abnormal protein is IgG in over half of the cases, one-fourth IgA, less than 10% IgM, much less than 1% IgD; and IgE is found rarely. Bence-Jones protein (kappa and lambda light chains) is present in the urine of over 50% of the patients. 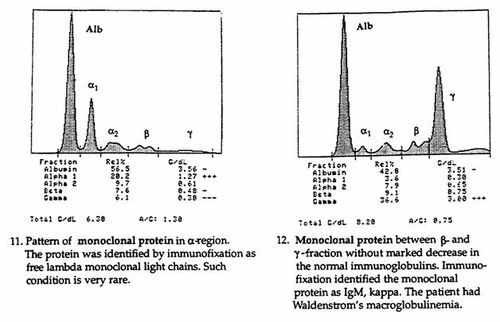 In about one-fourth of patients only light chains are produced by the abnormal plasma cells, and therefore monoclonal peaks may not be found in the serum since the light chains easily pass through the kidney. 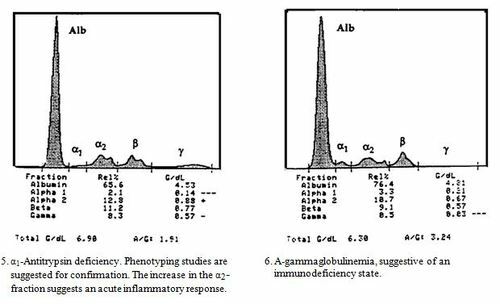 Hypogammaglobulinemia is often seen because immunoglobulin production by non-malignant plasma cells is also greatly reduced and catabolism is increased. 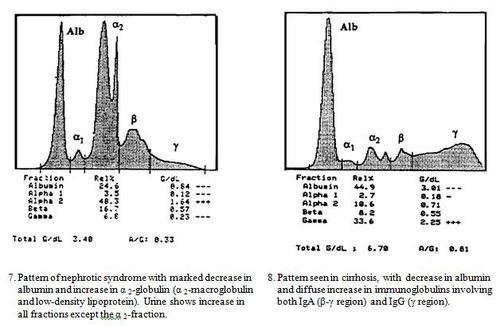 Waldenstrøm’s macroglobulinemia is characterized by IgM monoclonal proteins which cause hyperviscosity of the patients serum. Typically there is an absence of lytic bone disease and no bone tenderness. 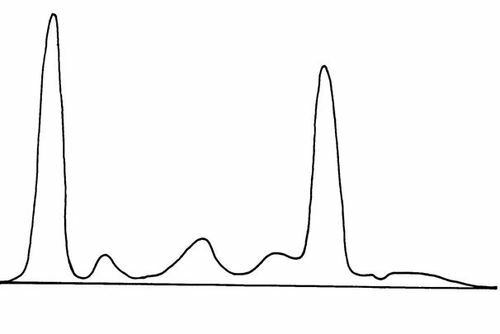 The abnormal protein is of the IgM type with a molecular weight of about 1,000,000 and a sedimentation constant of 18S (Svedberg unit). Bence-Jones proteinuria occurs in about 10% of these patients. The blood may be very viscous, because these large molecules do not readily leave the plasma for the extra cellular space. The very viscous blood leads to blindness, hypertension, and priapism. The term “monoclonal gammopathy of undetermined significance” (MGUS) denotes the presence of an M-protein in persons without clinical evidence of multiple myeloma (MM), macroglobulinemia, primary amyloidosis (AL) or other related disorders. This occurs in 50-60% of patients presenting with M-proteins. The term “benign monoclonal gammopathy” is misleading because one does not know if the process will remain stable and benign or will develop into symptomatic MM, macroglobulinemia, or a related disorder. The frequency of monoclonal gammopathies increases with advancing age. The prevalence of MGUS is 1% of patients older than 50 years, 3% of those older than 70 years, and increases up to 10% in persons over the age of 80 years. The incidence of MGUS is higher in African-Americans and lower in elderly Japanese. MGUS is characterized by: the presence of less than 3 g/dL M-protein in serum; fewer than 10% plasma cells in the bone marrow; lack of, or only small amounts of M-protein in the urine, and a low plasma-cell labeling index (PCLI). PCLI measures the synthesis of DNA and when elevated is good evidence that the patient has MM or will soon develop it. In addition, evidence of bone lesions, anemia, hypercalcemia or renal insufficiency must be absent. Most importantly, the M-protein must remain stable and no other abnormalities develop. In patients recently diagnosed with MGUS, serum protein electrophoresis should be stable. The test should be repeated in 3 to 6 months. If the M-protein is constant, the test should be repeated in 6 to 12 months. If the M-protein remains constant, electrophoresis and clinical evaluation should be performed annually thereafter. Patients should be told that the actuarial risk of malignant transformation is 17% at 10 years and 33% at 20 years. The rate of development of serious disease does not differ whether the M- protein is IgG, IgA, or IgM. However, patients should also be aware that evolution from MGUS to MM can be abrupt; and therefore, they should be advised to seek medical evaluation if symptoms develop. IgG after reaction with IgG antibody and protein staining. The sixth track identifies the light chain as λ. 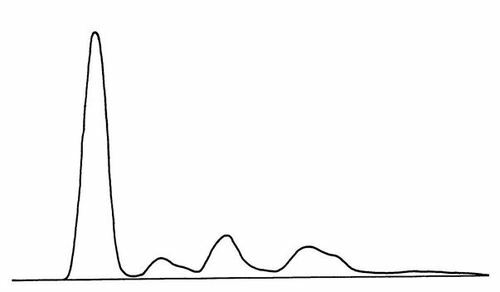 Example of identification of a monoclonal serum protein by immunofixation electrophoresis (Figure 2). 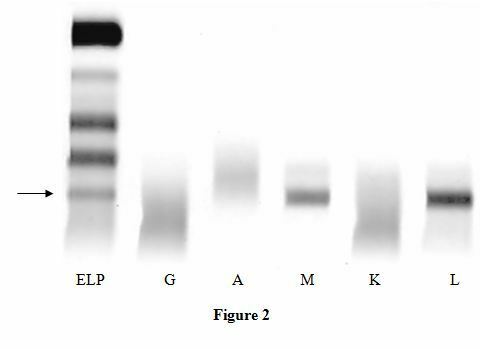 The first track is serum protein electrophoresis (ELP). The next tracks are IgG (G), IgA (A), IgM (M), kappa light chains (K) and lambda light chains (L). 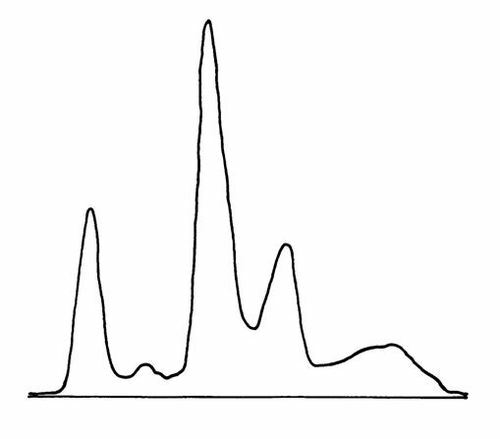 The arrow indicates the position of the monoclonal protein. The third track identifies the protein as IgM after reaction with IgM antibody and protein staining. The sixth track identifies the light chain as λ. An 84-year-old woman was admitted to a local hospital for sudden onset of severe pain in her right clavicular region. Previously, the patient had been in good health. Physical examination was essentially unremarkable with the exception of marked tenderness over her right clavicle. The patient denies having back pain. PA and lateral chest x-rays demonstrated a fracture of the right clavicle and a compression fracture of a lower thoracic vertebra. There was a lucency on the mid-portion of the 7th left posterior rib. Skeletal exam showed multiple cortical and medullary “punched out” lesions throughout the skeleton. Laboratory : Hb 10.2 g/dL, Hct 31%, WBC 5,200/µL (54 segs, 10 bands, 33 lymphs, 1 basophil, 2 eosinophils). 1. What is the most probable explanation (diagnosis) for these findings? 2. What therapeutic options are available for this patient? A 66-year-old man was admitted for biopsy of a neck mass. He had been well and actively employed as a painter until one year earlier when he fell from a ladder and sustained a subdural hematoma which was evacuated surgically. Fluid reaccumulated at the hematoma site, and a ventriculoperitoneal shunt was inserted. The shunt required multiple revisions. Infection was suspected but not documented. Four months earlier a right paratracheal mass was noted on chest x-ray and one month earlier a right supraclavicular mass was felt. On physical examination the patient had a mass on the right side of his neck, a palpable nodule in the right lobe of his thyroid, and several matted right supraclavicular lymph nodes. Laboratory: the patient had a hematocrit of 28% and hemoglobin of 9.1 g/dL. His WBC was 3300/µL. The peripheral blood smear showed marked rouleaux formation of red cells, and his ESR was 147 mm/h. Serum viscosity was 5.0. 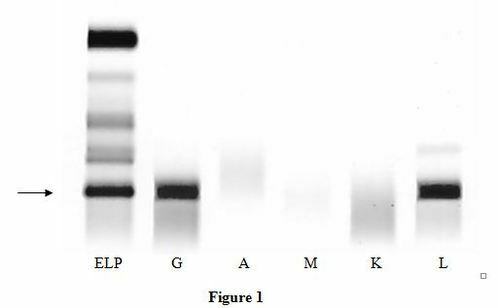 Urinalysis revealed trace protein. SUN was 23 mg/dL and serum creatinine was 1.2 mg/dL. Thyroid scan demonstrated iodine uptake into a nodule which was found to be a follicular adenoma on biopsy. Biopsy of the neck mass revealed a lymphoma. A 37-year-old woman was admitted to the hospital because of weakness and backache. For four years she has had episodic polyarticular arthritis involving her hands, knees, ankles, wrists, elbows, neck and sternal manubrium. Her arthritic exacerbations had been controlled with non-steroidal anti-inflammatory agents, but the patient discontinued them for fear of side effects. Physical examination revealed a large effusion in the patient's right elbow, a large effusion in her left knee with right knee tenderness, right ankle swelling and bilateral tenderness of her knuckles. The clinical diagnosis was ankylosing spondylitis. Laboratory: There was mild anemia with a hematocrit of 35% and a hemoglobin of 11.6 g/dL. The WBC was normal with an increased number of lymphocytes. The ESR was 75 mm/h. What is the most probable explanation (diagnosis) for these findings? An 84-year-old man was hospitalized for advanced chronic obstructive pulmonary disease. He has no complaints of back or other skeletal pain, no fever or weight loss. Skeletal x-rays reveal diffuse areas of patchy demineralization that could represent osteoporosis or early neoplastic disease. A serum protein electrophoresis was performed. Laboratory: Urine was negative for Bence Jones protein. WBC 9800/µL, 51 segs, 28 lymphs, 2 basophils, 1 eosinophil. A 49-year-old woman entered the hospital because of shortness of breath and distended abdomen. She is a chronic alcoholic who has been admitted several times earlier because of massive ascites. Her abdominal size has increased markedly over the past 2 months, and she is unable to walk more than 1/2 block because of shortness of breath. Two weeks earlier she fell, striking her back on the left side and has since had pain on the left side of her chest wall, which impairs deep inspiration. She has been following a low sodium diet and takes aldactone and vitamins. Physical examination revealed ecchymoses on the left posterior chest with tenderness in the region of the seventh to tenth ribs. Breath sounds were decreased at the left base. She had ascites with a positive fluid wave and a prominent venous pattern over the surface of the abdomen. There was 3+ edema from ankles to abdomen. 19 mmol/L, and calcium 7.8 mg/dL. Serum amylase was 135 U/L and CK 96 U/L. Her WBC was 18,300/µL with segs 73, bands 4, lymphs 15 and monos 7. The platelet count was 142,000/µL. The ESR was 54 mm/h. Clotting studies showed PT 16.6/11.1 sec and PTT 38.3/31.1 sec. ABGs on room air were pCO2 54 mm Hg, pCO2 28 mm Hg, and pH 7.51. A 23-year-old man was in good health until 1 year ago when he developed right lower quadrant pain. A work-up to rule out acute appendicitis revealed an elevated AST 220 U/L, platelets of 86,000/$\mu$L, and ALP 118 U/L. Several months later because of low platelets and significant splenomegaly, the patient's spleen was removed. The patient presents now with fever, muscle aches and jaundice, and the following laboratory data: AST 1460 U/L, total bilirubin 7.9 mg/dL, conjugated bilirubin 4.7 mg/dL, platelets 220,000/µL. What additional tests should be ordered? A 57-year-old man presented over 1 year ago with rectal bleeding of one month's duration. On physical examination, a large rectal mass was found. A surgical resection of the colon was performed and the tissue diagnosis was adenocarcinoma. At this time, the alkaline phosphatase was elevated. Over the past year, the patient's general condition has deteriorated with a chief complaint of back pain. Bone scan demonstrates numerous skeletal lesions throughout the ribs, long bones, spine and skull. Laboratory: Hb 9.1 g/dL, Hct 28%, CK 80 U/L, AST 20 U/L, ALP 935 U/L. An 18-year-old man in a third-world country was in good health until two years ago when he developed bilateral leg swelling which was treated with diuretics and steroids. He has no past history of malaria, renal disease, TB, or syphilis. The patient has been hospitalized numerous times over the past two years for the same complaint. Significant physical findings include periorbital edema and rales in both lower lung fields. There was +2 pedal edema. BP 110/75 mm Hg. 1.2 mg/dL, 24 hour urine protein 12 g. Urinalysis: Sp. gr. 1.042, 4+ protein, large numbers of granular and hyaline casts, 2-5 WBC/HPF, 10-20 RBC/HPF. A 34-year-old man presents with chronic breathing difficulties which have resulted in markedly increased shortness of breath over the previous week. He is unable to work because of pulmonary disability and has a history of smoking one to two packs of cigarettes per day for 20 years and of industrial exposures to borax and petroleum vapor. He has a chronic cough productive of yellow to green sputum occasionally streaked with blood and has had polyarthritis in the joints of both hands for several years. On physical examination, the chest is hyperresonant with depressed diaphragms, scattered wheezes, and rhonchi bilaterally. The cardiac apex is subxiphoid. Laboratory: Chest x-ray demonstrated hyperinflation of the lungs and blunted costophrenic angle on the right. Arterial blood gases were pO2 51 mm Hg, pCO2 34 mm Hg, and pH 7.43 while breathing room air. Hemoglobin was 14.9 g/dL and hematocrit was 44%. White blood count was 8000/µL with a normal differential and the ESR was 57 mm/h. Pulmonary function studies showed a marked reduction in lung compliance consistent with severe emphysema. The patient is a 43-year-old man. Three years ago he sought medical treatment for developing masses in his neck, axilla, and groin regions. At that time, his WBC was 115,000 µL with 89% lymphocytes. He has been treated since that time with steroids and chemotherapy. Total body irradiation was given. A splenectomy was performed. Recently he went to Mexico for initiation of holistic therapies but because of increasing weakness and dyspnea, he was transferred to the hospital. Where can I get the answers to these case studies? Would you please kindly send me the answers of these electerophoresis cases if you got them? Thanks for these interesting cases. What is the solution to Case 8? Increased alpha – 2 fraction: acute & chronic inflammatory diseases, nephrotic syndrome, oral contraceptive use, steroid use, hyperthyroidism, adrenal insufficiency, adrenocorticosteroid therapy, advanced diabetes mellitus. This case seems to be nephrotic syndrome (lab findings, history and low albumin fraction). However, if I had this picture without any clue and if albumin was normal, I guess that I would ask also urine electrophoresis, bence jones (24 h urine) & immunifixation. 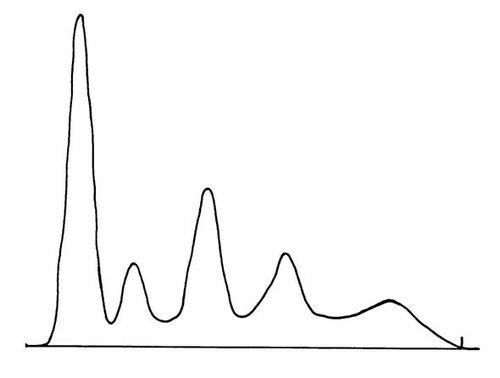 Rarely a M spike in the rest than gamma fractions may indicate a monoclonal protein. I have elevated gamma globulin level and my urine tested positive for lambda light chains…. what "could" this mean? You should go to the hospital and talk to a hematologist as soon as possible. It may be multiple myeloma. This reply is after 1.5 year. so I guess you have already talked to a doctor. Hi, how can I have the results of these cases? 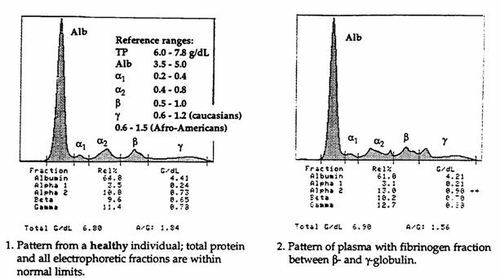 The albumin fraction (the 1st one) on serum protein electrophoresis will be low on malnutrition, but this occurs in medical problems and not in ordinary people. The best way is to check your serum iron, vitamin B12 and folate, as these 3 may cause anemia if deficient. Serum Total protein & albumin are less expensive that SPE and will show if you have low albumin because of malnutrition or a medical problem (incuding liver, kidney & intestinal). You may also check also serum glucose & electrolytes (sodium, potassium. magnesium and calcium). Moreover, you may check vitamin D (e.g. if you have low calcium, or high parathormone). You should do a CBC (FBC; full blood count) and a basic biochemistry lab exam +_ urinalysis. If you want a complete check up you may do also add an abdominal ultrasound, an ECG and a physical. For all these, you should consult your GP/ family doctor. Nutritional status is essential in specific patients (especially the ones with kidney failure) and it is complicated (e.g. we need to know the Nitrogen levels that relate to protein intake). The vitamin level estimation is expensive, is done in special labs and not indicated unless a specific medical problem is suspected. In any case, nutritional deficiencies are related to medical problems e.g. alcoholism is associated with pyridoxine (B6 vitamin) deficiency. Hi, did you find answers to these cases? I am looking for the case #4 please! what is the solution to case 2 ?? I am not sure. It seems a monoclonal protein related to the 2 cancers (lymphoma & thyroid cancer). An M component may be detected in other lymphoid malignancies and in solid cancers. But in this case, ESR is high and rouleux are seen in peripheral blood. Also M protein is >3g/dL. Hence, I guess that a multipe myeloma should be excluded with further tests. If it is positive, then it is weird that the patient has 3 cancers (thyroid, lymphoma, multiple myeloma) probably unrelated. In any case, this case study is confusing.